These early stamps of Bulgaria were designed by Georgi Yakovlev Kirkov, show the Loin of Bulgaria Coat of Arms, and were printed by the Russian State Printing Works in St. Petersburg. 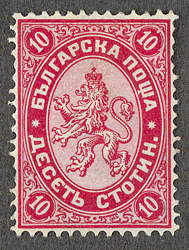 In the third issue of this design made in 1882, a sheet of the 5 stotinki was printed in error in the colours of the 10 stotinki rose and pale rose (shown here), rather than the correct green and pale green. The Tapling collection includes an example of the 5 stotinki error used on an envelope together with a 10 stotinki (the reverse bears seven normal 5 stotinki green and pale green). Few of these errors are known to have survived, including only four recorded used on envelope.